High winds and sandstorms in Peru have revealed previously undiscovered geoglyphs in the ancient Nazca Lines. Eduardo Herrán Gómez de la Torre, a pilot and researcher, found the new shapes while flying over the desert last week, El Comercioreported. He believes one of the geoglyphs depicts a snake 60 metres long and 4 metres wide, near the famous “hummingbird”. A bird, camelids (possibly llamas) and a zig zag line are among the lines found etched into the ground on hills in the El Ingenio Valley and Pampas de Jumana. Archaeologists are already trying to confirm whether they match the Paracas culture in the Ica region of Peru, which flourished from 800BC to 100BC and influenced complex textiles and ceramics at Nazca as well as the lines. One archaeologist, Orefici Giuseppe Pecci, said the geoglyphs confirmed the close relationship between the ancient artworks and water. The Nazca Lines cover an area of approximately 280 square miles and are believed to have been scratched into the ground over a thousand years between 500BC and 500AD. 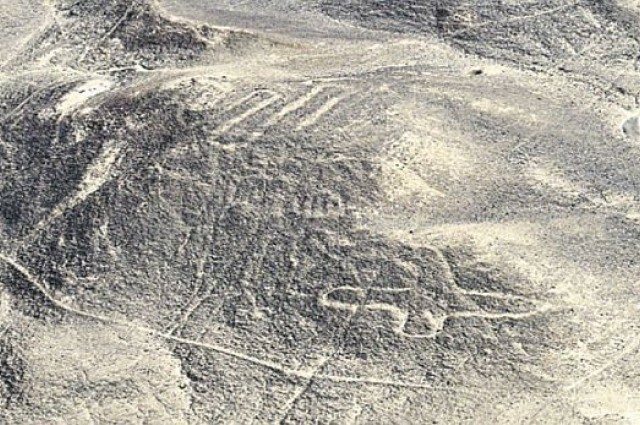 UNESCO, which designated the area a World Heritage Site in 1994, describes the Nazca Lines as “a unique and magnificent artistic achievement that is unrivalled in its dimensions and diversity anywhere in the prehistoric world”. Their quality, size and continuity put them among archaeology’s greatest enigmas and they are believed to have been used for astronomical rituals. Animals, birds, insects, plants and imaginary beings are depicted as well as lines and geometric figures several kilometres long. The largest creature is a 285 metre-long pelican and other famous geoglyphs include a spider, monkey and lizard. One strange creature has two human hands, one with only four fingers, and everyday objects like looms are also seen. Ruben Garcia Sota, head of Ica’s archaeological authority, told El Comercio the latest discovery was “a valuable contribution to our knowledge of ancient Nazca”.